Download the trial version or buy the full version. ChemGym is a web app that should work even when you don't have a connection to the Internet. It achieves this by downloading all the files and images it needs when it does have an internet connection and saving them for later. When you first start using ChemGym it will try to download about 2 megabytes of data. Depending on the speed of your connection this could take anything from 20 seconds up to several minutes. When all the necessary files have been downloaded successfully, ChemGym will display the message "Content cached for offline working". If you are interested you can check the progress of the download by navigating to the "About" page. While the download is going on, you should be able to use ChemGym as normal. As further content is added to ChemGym or any corrections are made, the changed files should automatically be downloaded to your device. A licence to use ChemGym costs £4.99. This entitles you to install ChemGym on all the suitable devices you own or use. You will need to provide your email address so we can send you your registration code. Payments are handled via the Stripe payment system and none of your card details are seen by or stored on any of the ChemGym servers. When your purchase is complete you should automatically be redirected to the ChemGym app. Having a problem using ChemGym? Try reloading the page to see if the problem persists. Try using a different web browser like Google Chrome, Firefox or Internet Explorer. Report the problem by email to support@chemgym.net giving as much detail as you can. Use the supportdetails.com web site to find out more about your web browser and send the information to support@chemgym.net. Remember to click on the blue "Send Details" button when you get to the supportdetails.com web site. 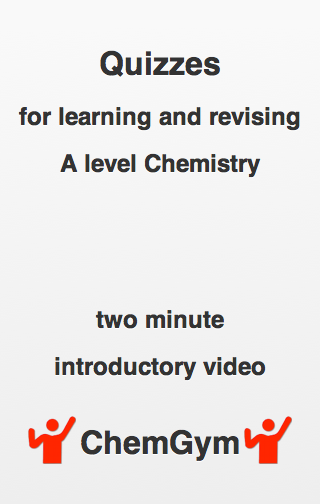 Which exam boards does ChemGym cover? 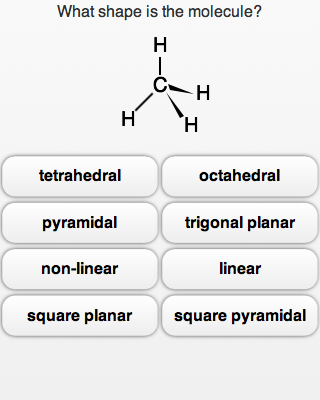 Much of the content of ChemGym will also be relevant to other chemistry courses studied at ages 16-19 but you will have to pick the relevant topics by referring to the relevant syllabus or with advice from your teacher. 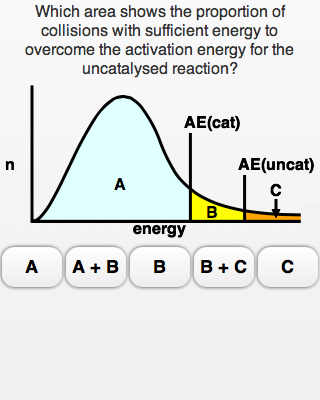 Does ChemGym cover the whole A level course? No. 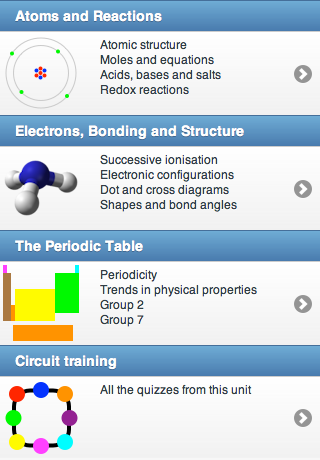 ChemGym focuses on the parts of the A level course that can easily be tested on a computer or mobile phone. It should help improve your chances of getting a good grade by making practising certain skills more fun and by providing an incentive to revise regularly and often, but you will need to do others sorts of revision as well. What sort of questions does it have? What does the demonstration version of ChemGym contain? 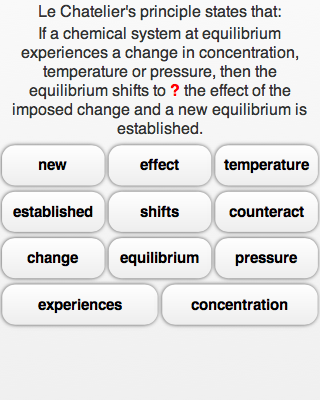 The demonstration version of ChemGym contains 10 quizzes from the full version designed to give you a feel for how ChemGym works. 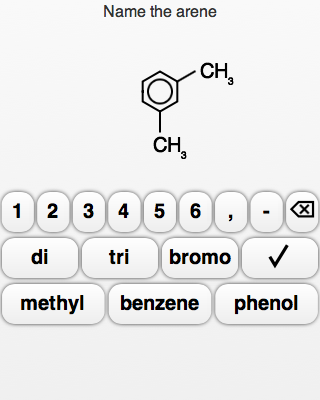 What does the public beta version of ChemGym contain? 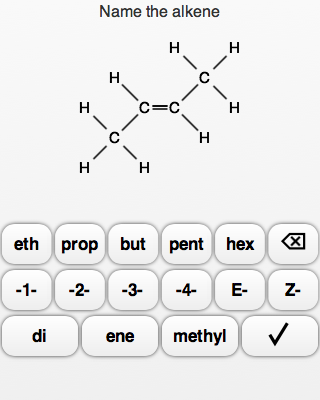 The public beta version of ChemGym contains the full set of quizzes found in ChemGym. The public beta version will revert back to the demonstration version at the end of April 2013. We hope you will be able to purchase the full version of ChemGym by the start of May 2013, but if this is delayed, the public beta period will be extended. What are the letters and numbers near the bottom left corner of the screen? 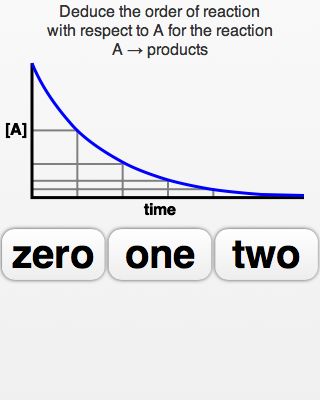 The pair of letters are a code for the quiz and the two digit number is a code for the question in the quiz. This information is displayed to aid reporting of errors during the beta testing period. If you think you have found a problem with one of the questions in ChemGym please send an email to support@chemgym.net giving as much detail as you can about the problem. 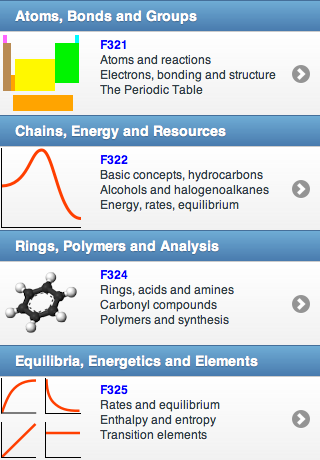 Why are some topics missing from ChemGym? 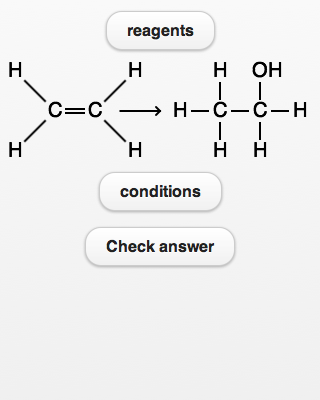 ChemGym is designed to let you enter answers with a few clicks of the mouse or taps on a mobile phone and to get immediate feedback. 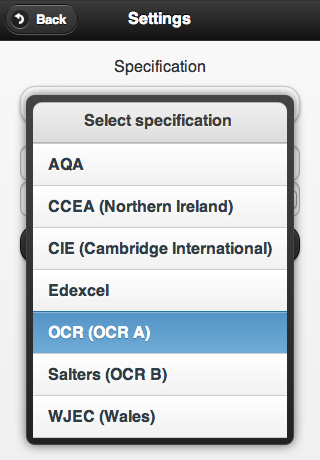 Some topics in the A level course are not suited to this type of approach. Why is the app called ChemGym? 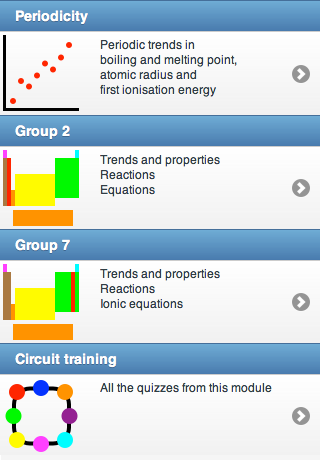 ChemGym is meant to be like a gymnasium where you go to improve your chemistry skills. It is based on the idea of circuit training where you practise a skill for a certain number of repetitions or a set time before moving on to another skill. You can decide whether to do a short easy circuit or a longer, harder circuit depending on the stage your chemistry revision has reached. How many devices may I install ChemGym on? 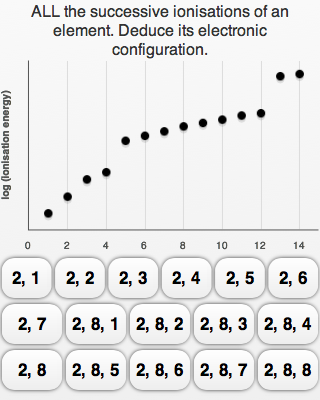 There is no fixed limit to the number of devices on which you may install ChemGym. Feel free to install it on your laptop, mobile phone, iPod, tablet etc as you find convenient. Your registration covers the current version of ChemGym and all future versions. It is a one-off payment that will not need to be renewed. I've lost my registration code, what can I do? You can tap on this button to request that your registration details be resent to the email address you used when you bought ChemGym. If you have lost your registration code AND have changed your email address since registering, you will need to buy ChemGym again. You can tap on this button to find out how best to report a problem with ChemGym. How does "timed-mode" work in a ChemGym circuit? When you are doing a circuit in "timed-mode" the clock starts ticking when you first get a question correct and the time is only checked as you get further questions correct. That way if you get a question wrong right near the end of your timed period you will still have time to read the feedback as carefully as you choose. Only when you next get a question correct will the application move you on to the next quiz in the circuit. What usage data does ChemGym send out? ChemGym sends out a small amount of information each time it is launched, such as the specification you have selected and the other values on the settings page. 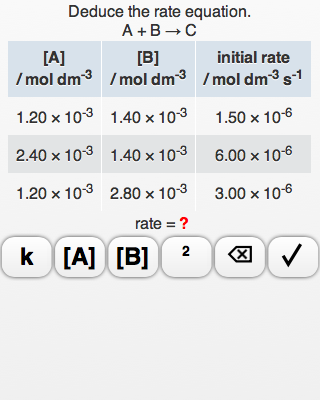 ChemGym also sends out a small amount of information each time you answer a question, such as which quiz, which question and whether you answered it correctly and when you achieve a new level. The usage data cannot be linked with you personally. 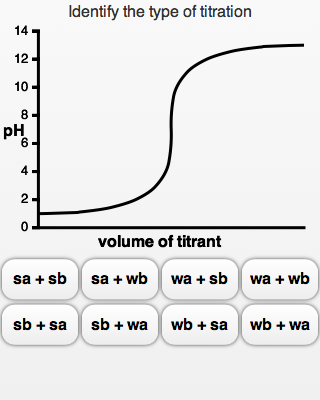 It is collected anonymously using the Google Analytics system to assist with the future development of ChemGym. You can opt out of sending usage data on the settings page. Which browsers does ChemGym work on? 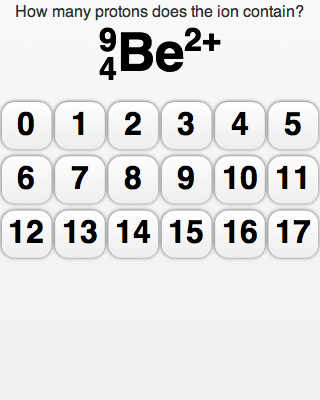 ChemGym should work on all modern browsers that support html 5. ChemGym has been tested and found to work on the following operating systems and browsers. Which browsers does ChemGym NOT work on? ChemGym does not work usefully when using any of the following browsers. 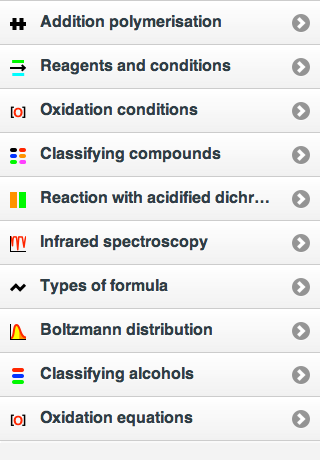 Some features of ChemGym do not work when using any of the following browsers. What can I do if ChemGym does not work on my phone or tablet? If ChemGym does not initially work on your phone try installing a different browser like Google Chrome and using that to launch ChemGym. 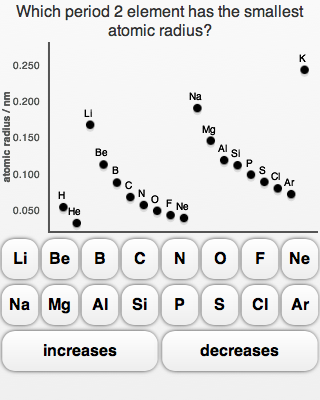 If your phone is more than a couple of years old it may not be powerful enough to run ChemGym but you should be able to use it on your desktop or laptop computer.